Local fifth generation family owned business since 1840 located in Eugene Oregon beginning in 1943. Selling direct to the public products made on site and offering installation in the local area with shipping available for other locations. 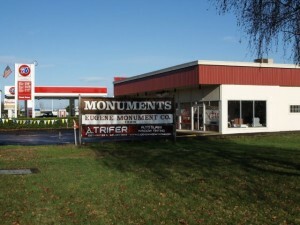 Eugene Monument has been working with local cemeteries and funeral homes for over 60 years in Oregon. 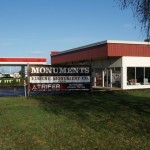 This experience makes them the top choice for you monument and architectural signage needs. 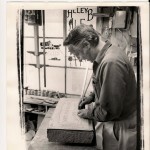 If you give them a call, or visit the show room the first thing that you will discover is that the person helping will probably be Richard Collett who also happens to be the one who will be doing the design work, engraving and installation for any purchase that you make. That’s right now waiting around for some out town or out of manufacturer to get the order done the way you want it. Richard will take care of you just like his father (Ned), grandfather (Archie), and great grandfather took care of their customers. All design work and engraving is done in house for total control of the final product. Installation is also available working with the location of your choice meeting their requirements. Buy direct and save. 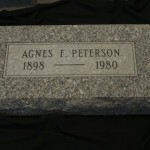 Both Granite and Marble stones are available for engraving. Bronze Plaques, Laser Imaging, and Photo Medallions are also available. Other items that are offered are vases, plaques, and commercial signs for offices and municipal buildings. Delivery and installation is available for Eugene, Springfield, Corvallis, Albany, Lebanon, Roseburg, Salem and most outlying locations. 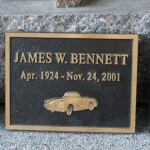 Grave markers are available in Granite, Marble, and Bronze. Some of the terminology that causes a lot of confusion is the names given to the different types of stones. 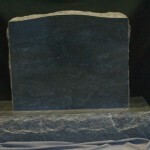 The stones that stand up and have engraving on the front are called “upright stones. Flat grave markers are the most common currently. 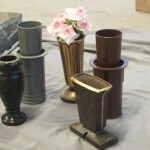 They are available in Granite, Marble, and Bronze. The 24×12’ for single markers and 36”x12” for companion usually the stone in 4 inches thick. What makes the difference between a Raised Stone and a Flat marker is the way that they are installed. 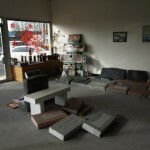 The raised stones are normally set on a concrete base and the flat stones are set in the ground at grass level. Knowing what is available and where they can be used is another way that Eugene Monument can help you make the right choice. Choosing the right style, type of stone and the design is made easy with the large selection in their show room along with the hundreds of photos that can be reviewed at your leisure.